We've got just over a week until London Fashion Week commences. Hands up who's organised? Nope, me either! I've got a couple of exciting store appointments this week to hopefully sort out my non-existent Fashion Week wardrobe. (Because who's ever statisfied with the clothes we already own?) Head over to my Instagram @HannahCrosskey to keep up to date with my fashion week rush! I love everything about this look, naturally. What's more easy than chucking on layers apon layers of your favourite knitwear and running around in chic black trainers. (Yes trainers have now become chic.) If your a major fan of Celine on a Primark budget I've found the perfect trio shoulder bag for you here. It is the perfect size for all your essentials, plus it comes in three different colours. Bonus! 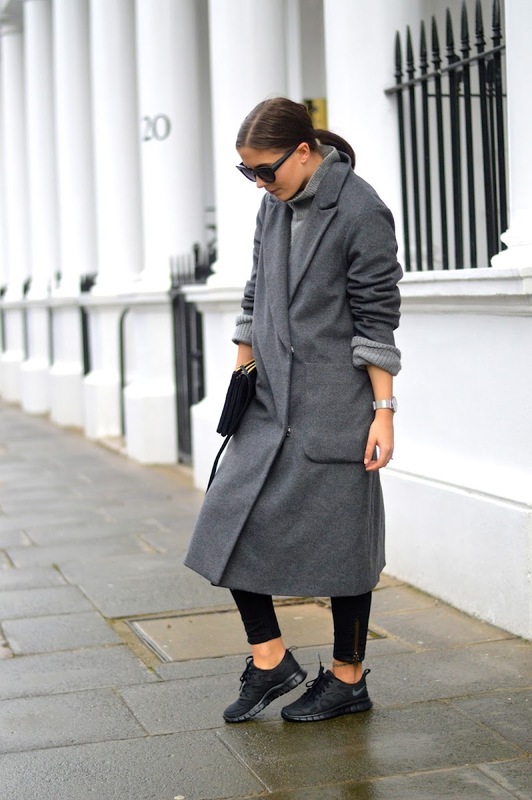 Love the grey maxi coat and the sneakers a lot! This coat is beautiful love everything about this look! Can't wait to see what you're wearing for LFW! This outfit is also perfect. Why do you have so many amazing coats it actually hurts me inside?? ?